All my barbecue lamb recipes deliver tasty, delicious results that will have you coming back for more - I guarantee it! 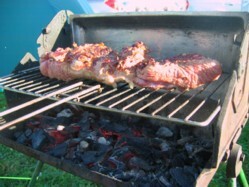 Take a look at this beautiful barbecue lamb shoulder that I did on a recent camping trip. I just asked my butcher to take the bone out (butterfly it) and what you're left with is a beautiful slab of meat, perfect for just seasoning and slapping on the grill. Great results and what could be more simple? Lamb is full of flavour and fantastic on the grill. Garlic and rosemary really go well and try putting soaked sprigs of rosemary directly onto the coals for a subtle enhancement in flavour. (For gas grillers - wrap the rosemary in foil, puncture the foil parcel a few times and place it on your flavor bars). It is also similar to beef in that it generally is served pink in the middle and to be clear, provided it's a solid piece of meat, there's nothing unsafe about serving it this way. If however it's a burger or a meatball you must make sure that it's cooked through and the secret to safe barbecue cooking is patience, sizzle and above all no flames. Use a bbq thermometer to check that you've got the appropriate safe internal meat temperature. When is lamb at its best? Usually around Easter is the earliest that I would consider eating new season lamb. Lambs breed once a year in the Spring so to be eating "new season" lamb any earlier than Easter really hasn't given the animal time to mature and enjoy a bit of life. 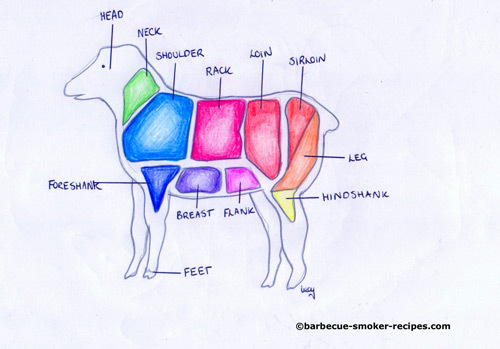 Lamb (under a year) is absolutely perfect for grilling and pretty much all joints are suitable for grilling. This is because the animal is slaughtered before their connective tissues become tough so the tissues dissolve easily in the meat's natural moisture during cooking. So even neck chops are good. Best cuts for the grill? Loin, leg and shoulder are my favorites. I mentioned above about removing the bone from the shoulder or leg, if you want to try it then either of the first two recipes below is where you need to click. The shoulder has slightly more fat on it, I prefer it but if you want supremely lean then go for the leg. The loin is generally sold as chops and they are quite meaty, in fact very much like small T-bone or Porterhouse steaks. 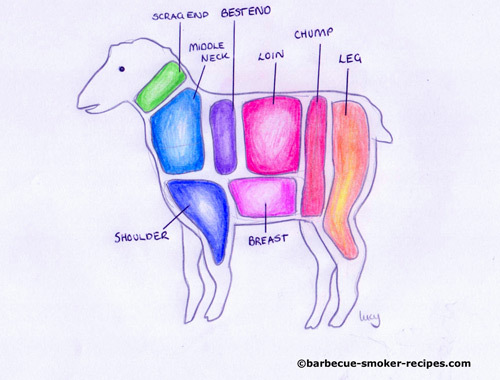 The various cuts of lamb are referred to with different names dependent on whether you reside in the UK or North America so I have two diagrams for you showing the butchers anatomy of a sheep. The fat in lamb should be crisp and white with the meat lean, fine grained, firm and pinky brown. There is usually very little gristle. Freshly cut lamb should look slightly moist and the bones should be pinky white. When it's a year old my butcher refers to it as "hogget" and when two years old "mutton". Many think mutton to be tough and yes the meat does generally get more chewy as the animal ages but then so the flavor develops too. For me both lamb and hogget are great for these barbecue lamb recipes below but mutton I reserve for slow cooking in the Dutch oven.